The construction of the Afghan museum celebrates the richness of Afghanistan’s cultural heritage and the spirit of its peoples. In a nation devastated by war, the wealth of its cultural background and the spirit of its peoples are embodied here. In spite of the years of conflict and turmoil, the underlying strengths of the country remain intact, embedded in the earth and rising from it. 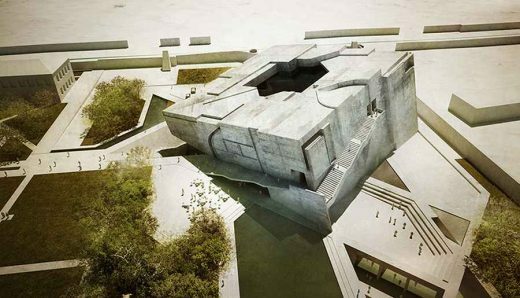 The new National Museum of Afghanistan awakens the nation’s cultural heritage through powerful symbolic references, where physical fragments and traces inform us of its past. This concept is well illustrated in the ‘negative spaces’ of the artist and sculptor Rachel Whiteread that highlight the memory of an object, rendering the invisible visible through a reversal of solid and void. Here this ‘absent presence’ is found in the day-lit foyer, a tranquil and serene space filled with water and greenery. Entering the main hall, each visitor defines their own experience of the museum, ascending the monumental stairs from the foyer at its heart, aware of the depth of knowledge expressed in the deep recesses of its masonry walls. If the façade acts as a reflection of our society today, then the monolithic walls embody our history and culture. As if hewn from solid stone, the galleries bring to mind the very origins of space and knowledge. Each of the country’s eight significant historic periods is represented in a dedicated space designed to house representative artefacts. A perambulation through this sequence of spaces unfolds a voyage of learning and discovery. Carved ramps and stairs overlook the foyer with the sequence of galleries unfolding in an intriguing and complex geometry. The new museum’s 56 metre square cube represents the significance of 7 and 8 in Islamic culture. There are seven verses in the Koran, here representing rebirth, and eight principal galleries in the program, the indeterminate open sky acting as a metaphor for the future. The site geometries and composition define the garden setting with a series of water features designed to refresh the air during the summer months. The orientation and planning of the museum introduces cool, shady areas for outdoor promenades, and the landscaping strategy enhances on-site bio-diversity and shaded meeting areas. The museum’s gardens respond to the intense climate of Kabul and include native grasses and indigenous plants. Landscaping includes a stepped garden with covered seating areas and additional dedicated spaces for the museum’s educational programs, including tours, garden lectures and outdoor performances. A sustainable environmental concept determined the orientation, layout and design of the building envelope. The exposed concrete envelope introduces the required thermal mass, and the natural/displacement ventilation and highly efficient lighting systems reduces the overall energy consumption and provides a passive internal environment. Above the main foyer, digitally controlled external sunshades respond to protect the interior from the intense solar gain, reducing cooling loads internally. The orientation and inclination of the building allows controlled daylight internally with the potential for solar harvesting technology and a renewable energy supply. Internal heating and cooling is achieved through boreholes/earth tubes or crypt cooling, allowing air to circulate through large diameter underground pipes that discharge internal heat build-up via a stack. Materials are generally specified to be sourced and fabricated locally. Efficient use is made of the rainfall and humidity in the winter months. The soft landscape acts as a filter to collect and store rainwater for irrigation and grey water use and the fragmented form of the envelope acts as a natural purifier that provides potable water for the complex. A future extension to the museum is considered in the concept design and planning, so that additional storage areas and communicating spaces can be successfully added. An twinned volume extension to the existing building is envisaged, with visitors following a mirrored circulation route, descending through the galleries from above. The Timeless Cube embodies the strength, pride and traditions of the Afghan people, providing visitors with better understanding of the country. The new landmark will be a stage for debate and reconciliation through an educational program that creatively engages people of all ages in traditional and non-traditional learning. The history, identity and traditions of its peoples will provide the bedrock for future generations to understand the culture of their forefathers and a unity in the region. October 14, 2012 in Afghanistan.